Conakry along the country's Atlantic Ocean coastline is both the capital and the largest city of Guinea. Central Conakry in July 2013. The country of Guinea is located in West Africa, sitting along the coastline of the Gulf of Guinea and the greater Atlantic Ocean. Guinea encompasses 94,927 square miles (245,860 square kilometers) in size and has a population of around 11.75 million people. Guinea gained independence from France in 1958, and today it is a majorly French-speaking nation that mostly relies on mineral production and agriculture for its economy. The city of Guéckédou is the third largest city in Guinea, with a population of 221,715 people. The city is located in the Guéckédou Prefecture of the Nzérékoré region in the southern part of the country. The population of Guéckédou has almost tripled in the last twenty years as the greater population of the country has increased by close to 4 million over that time. The city is most well known for its large market that takes place every week and attracts traders and visitors from across the southern part of the country as well as the neighboring countries of Liberia, Sierra Leone, and Côte d'Ivoire. The city has seen its fair share of violence and problems over the last two decades as the fighting from the Sierra Leone Civil War (1991-2002) and the Second Liberian Civil War (1999-2003) spilled over heavily into the area in 2000 and 2001. The city was also a center of protests, strikes, and riots against then President Lansana Conté (1934-200) in 2007 and was one of the areas involved in the 2014 West Africa Ebola outbreak. The city of Nzérékoré is the second largest city in Guinea, with a population of 238,928 people. The city is located in the Nzérékoré Prefecture of the Nzérékoré region. Like Guéckédou, Nzérékoré's population has also increased rapidly in the last two decades, having slightly more than doubled. The city is noted as an economic and commercial center in the southern region of Guinea and is a market town with its own airport that is known for its silverworking. The rapid growth of the town did not start until after the end of World War Two when it became a center of trading and administration and had a sawmill and plywood plant built. During the First Liberian Civil War (1989-1997) and the Second Liberian Civil War the city was disrupted due to the many refugees that spilled over the border and came into the city. The city was also the location of 3 days of fighting during the 2013 Guinea clashes between the ethno-religious groups of the Fula and the Malinke over the transparency of the presidential election. 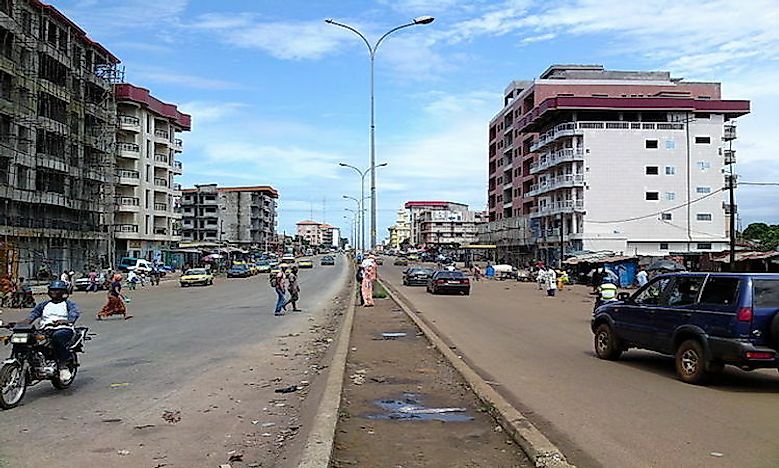 The city of Conakry is the capital city of Guniea and by far the largest city in the country, with a population of 1,660,973 people. The city is located in the Conakry Region and sits on the coastline of the Atlantic Ocean as a port city in the western part of the country. The city was founded in 1887 when France took control of the Tombo Island where the city was located. The city became the capital of French Guinea in 1904 and started developing as a major export port since then. The population of the city has skyrocketed in the last half a century, going from 50,000 in 1958 and growing to what it is today as the administrative, economic and communications center for the country. The city has several universities and museums, as well as hospitals, parks, hotels and markets. The city has had faced numerous challenges in the past and was the location of the Camp Boiro concentration camp set up during the rule of President Sekou Toure (1922-1984), was the site of over a hundred deaths during the 2009 Guinea protests and having water and power cuts over the last decade. The country of Guinea is just coming out of a disputed presidential election and having officially being declared free of Ebola in 2015. The economy of the country has been badly effecting by the Ebola crisis, low commodity prices, the capital city has been having power and water issues for the last decade and around 55% of the population has been affected by poverty. To counter this the government has launched a five years development plan starting this year to address the poverty, infrastructure issues and have a post Ebola recovery plan for the country.